So I have mentioned this before but one of the things anyone can do to elevate their style is to add that third piece. Adding a “third” piece pulls your look together. It makes you look complete and gives you style credibility. This is the reason that some retailers have their associates employ this simple trick. Back in March, we looked at a winterized outfit including a scarf, vest, and boots. Now, with a few more months of warmer weather, here’s a look at a way to add that third piece without covering up. While this can be tricky, it can be achieved. For example, take this outfit. The cropped pant and black shirt have a lot of character on their own. The cropped pant’s wide leg with the gigantic flower print effortlessly commands attention. All the more reason to top it with a more subdued shirt. So I chose a black shirt to contrast the bold green in the pant. But I still wanted some flare and the peplum didn’t disappoint. Finally, I cinched in the waist with this black skinny belt. However, the piece de resistance is the chunky silver necklace and oversized earrings. Sometimes one key piece just doesn’t do and you have to add that third, forth, or fifth piece to achieve a signature look. Tell me what you think. Have you mastered this style tip? So me your 3rd piece and how it elevated your look. Comment, like, share, follow. And check out Part I of The 3rd Piece is Key: Elevate your style with this simple tip here. love your pants! so bold but suits you! I love those pants! It’s a bold statement. It is bold and that is why the black top was key. Thanks so much for commenting. Your entire look is very lovely! My third piece is most often a necklace with a bracelet thrown in now and again. Thanks so much! I loved this look. Trying to add more bracelets to my collection. Jewelry is such an easy way to elevate your look! Heidi Klum said if you have $100 to spend on a wardrobe update to spend it on jewelry. I agree. Jewelry can make a look go from drab to fab in a heartbeat! Look at you slaying in those cute pants and wedges. Love the overall look! Love the pants, wedges and jewelry. I’m also a huge fan of nail polish, so you blue pedicure really brings it all together! Thanks! I love wearing unexpected nail colors. It just adds a little fun to any look! Cute outfit. I like the silver. Sometimes I add a third piece with bracelets but maybe a necklace would make a better statement. Never to let to master the idea. Werk it girl! Very Chic, love the top! Thanks. The peplum is a flattering style on most! This is one of my go to pieces! Love this look! I am all about bold colors, and you pulled this off effortlessly. This is my kind of outfit! 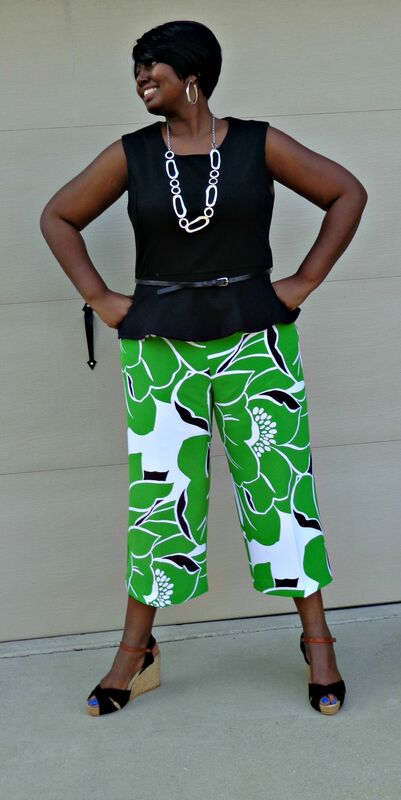 I love how you style those green capris. I still need to get me a peplum top. I love how the bold necklace ties the outfit together! I’m just learning about how essential a third piece can be, but it can take your look up to the next level.